Born 1 December 1897, Kearsley, near Farnsworth, Lancashire [registered in Bolton, December 1897]. Attended Kearsley Moor Church of England School and Farnworth Council School. According to the 1901 census, Thomas is the youngest of three children to Thomas and Mary Hannah (née Nelson). They live at 11 Alma Street in Kearsley. His father is a hewer in the coalmines. According to his school admissions, Thomas beagn Kearsley Moor Infants on 24 February 1902. Living at Manor Cottages. He joined the juniors on 1 June 1905, and now living at 53 Slackey Brow. According to the 1911 census, Thomas is the youngest of the three children living with their 'married' mother at 34 Lindley Street in Kearsley. Thomas is a 'cop packer'. The cenus reveals that Thomas' parents had five children, and that two had died. According to the 1939 register, Thomas, an unemployed ex-professional footballer, is married to Prudence and they live at 2 Villa Avenue in Wigan along with son Thomas K.
Died 6 June 1967 in Wigan, aged 69 years 187 days [registered in Wigan, June 1967]. Club(s) Played schoolboy football as a centre-forward with St. Stephen's FC, a Sunday schoolside in Bolton. Afterwhich he played with Newton Lads FC. Played Army Football (Private in the Lancashire Fusiliers) during WW1. And played with Altrincham FC and Rochdale FC afterwards, rejecting an offer to join Bolton Wanderers FC. He joined Aston Villa FC on 12 April 1922 for a �1300 transfer fee, where he remained until 1 May 1935, competing in 338 league appearances, scoring twice. Villa decided not to retain Mort, and in turn, with no other clubs coming in for the ex-international, he walked away from the game in June. Player number One of four who became the 468th players (469) to appear for England. First match No. 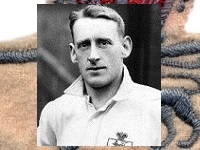 139, 3 March 1924, England 1 Wales 2, a British Championship match at Ewood Park, Ewood, Blackburn, aged 26 years 93 days. Last match No. 149, 17 April 1926, England 0 Scotland 1, a British Championship match at Old Trafford, Stretford, Manchester, aged 28 years 137 days. No additional information. - An English Football Internationalists' Who's Who. Douglas Lamming (1990). Hatton Press, p.180/1.